At the time of this writing, Cadillac’s website contains the image you see above. 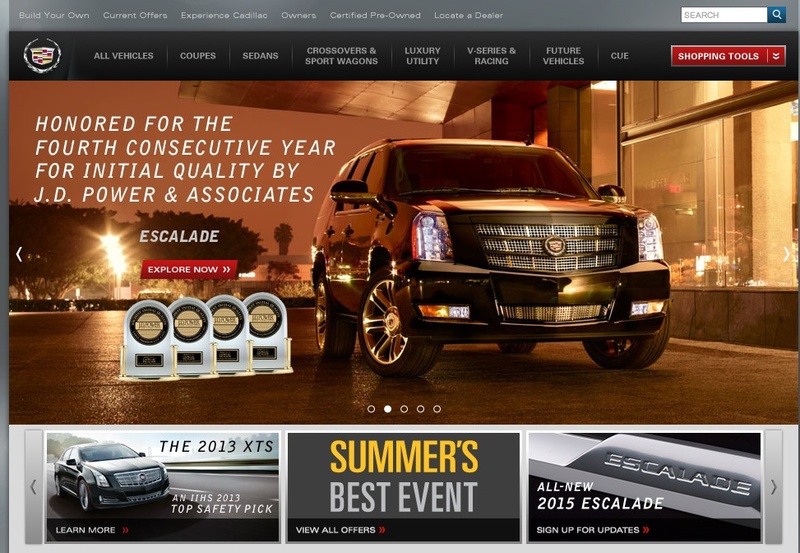 The words “ALL-NEW 2015 ESCALADE” are overlaid on top of the image, inviting website visitors to sign up for updates on the all-new luxury SUV. We didn’t have to call in a trifecta of rocket scientists to realize that the image in question, which contains the Escalade insignia in a bold font on top of a chromed trim piece, is probably the chrome trim piece that will adorn the area surrounding the SUV’s liftgate handle on the tailgate. Conversely, it could be a trim piece placed on the side of the vehicle, on its doors or fender, for instance. Either way, outside of this unofficial image of the upcoming SUV’s headlamp cluster, this photo is the first bona fide teaser of the 2015 Escalade we’ve seen. We expect GM to unveil the all-new Escalade in October at a special event, and launch the K2XX-based SUV in the Spring of 2014. Never too late to trust… but verify. News to me. Looks to be the handle to the liftgate? Pretty sure nobody anywhere has as much news and content on the 2015 Escalade up to this point as we do. On the lift gate? Hmmm, when i first saw it i thought it was the end of the cladding along the bottom of its doors. or both 3.6 TT and the 6.2 Ecotec? When will the Hybrid or EREV Escalade appear? GM must offer luxury and economy soon on all lines. The Cadillac ELR is the first step. Will it be the same size as the present model? With all the hype surrounding this huge nameplate the next Escalade had better be light years ahead of it’s corporate siblings! I too would like to see a greater variety of options in the lineup. Such as an extended-range model, a hybrid model or possibly even a diesel model. And the interior quality and features must truly make the Escalade a home away from home! Which means the tech has to practically rival the likes of a Bentley or Rolls Royce; albeit with less “bling”. If they can put reclining rear seats with message functions, state-of-the-art rear seat entertainment, coolers/mini refrigerators and flip-up ipads in the back of their cars-even the likes of Hyundai offers some of these things-then why can’t we see them available in a full-size luxury SUV? These are the things that Cadi “lacks”, which is keeping them from being a true world-class luxury brand!